I lost a hub cap on I-94 in Michigan a few years ago. I was on my way to the Detroit area for a WPC meet, in a construction zone, just crossed a rumble strip due to a lane shift. I heard a noise, looked in the mirror, and saw the hub cap spinning along behind me. It eventually hit the concrete wall separating oncoming traffic, then I couldn't see it any longer. There was no place to stop in the construction zone so I had to keep going. I had to go the rest of the week at the WPC meet, and show, with a missing cap. I took the other 3 off for the drive home. Luckily I had a spare at home that I could clean up and put on once home. 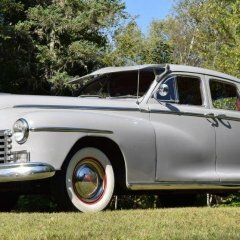 In 1939, the Royal tour across Canada had 3 "39 McLaughlin Buick limousines ( parade phaetons ) very heavy with truck style rims and special hub caps which looked like regular Buick Caps. Only 3 of these cars were made and since they had side mounted spares there would have been 18 such caps in all. One car lost a hub cap on the cross Canada trip. 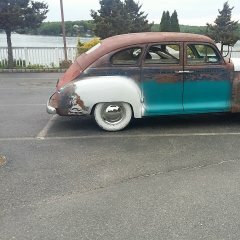 I first saw this car in 1958 when its owner brought it our for participation in another royal tour on Vancouver Island. It was missing one cap. Many years later (maybe 50) the missing cap turned up at a swap meet but was found to be too large for the regular Buick. The purchaser knew what it was for, the current owner of the limo was contacted and the cap reunited. It had hung on someone's barn wall for most of the time it was missing. So there is hope for your missing cap to be returned however, D24 caps are easy to get. I have several sets on my wall. I have seen advice somewhere-possibly someone on this forum to take a sharpie and write your cell # inside the hubcaps. Then you can hope the finder will give you a call. About 5 yrs ago my wife and I were driving with a group of 4 or 5 other couples out. For an afternoon lunch in our old cars. Suddenly I heard an odd noise and looked in the rear view mirror in time to see a hub cap spin off into the weeds on the side of the road. I couldn’t stop quick because of our group caravan, but made careful note of where we were on the road. When we got to our lunch stop I discovered that the steel inner hubcap was still on the car. Only the stainless steel skin had come off. Later, after we had returned home, I went back and found the hubcap skin about 50 ft off the road in some trees. I later epoxied the skin back in place. It has been on the car ever since. Ohh, this painfully remembers me to a test ride with my almost 80 year old flathead motorcycle. I had problems to get my freshly rebuilt carburetor properly adjusted. On the felt 100th test-ride I heard a slight popp. As if by magic the engine ran perfect. ... but I also saw a car coming from the opposite direction. Nooo, not ... I again heard a popp and another popp... The tires of the car exactly met the cover which then was flat like a tin can which got under the foot of an elephant ... I could have howled. Today I can laugh about it ... and isn`t that and the posts above the stuff that we have forever in mind and tell each other at the campfire ?!! My hubcap story, told before. Hubcap lost on the way to a DeSoto convention. Passersby saw it, and called out, so I knew generally where to look. Scoured the area several times afterwards, no luck. Months later, DeSoto magazine had an ad by a co-worker of the man who found the hubcap. The co-worker was a club member. Reconnected with the hubcap. Happy. After that, I marked my name and pnone number inside all my hubcaps. Buick limos with special hubcaps? Believable. The long wheelbase Mopars had heavier duty running parts, including heavier hubcaps. I think I'll write my hard line phone # inside of caps. I dab a bit of clear silicone adhesive in three places around the edge of my hub caps , I haven't lost one in several years now that I use this method . Dan, never thought I'd read "Tonawanda Creek" (or as we used to call it "the Crick") in a post. I grew up 50 yards from the Tonawanda, in Batavia. I used to lose my right front hubcap with too much regularity when I hit a pothole. All the other caps held on fine. I tried bending the retaining clips on the wheel but it didn't seem to help. I asked my shop guy to do something about it when the car was in for other work. He bent the clips and I haven't lost one since. And that cap is not harder to get on and off than the others. You were way out close to where it started! My agency did a lot of business with the Federal detention facility there. We lived in Wheatfield, only about 1/2 mile from "the Crick". (More of a river by the time it got to us, and part of the Erie Canal.) I'd run along it every Sunday, and we'd take a spin in the old Dodge along it on occasion, the State tended to keep that road in pretty good shape.